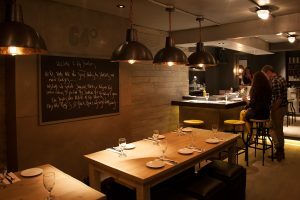 Part of the Ginger group of restaurants including Ginger Fox, Ginger Pig & Ginger Dog, the Gingerman is, in our opinion, the finest of the four. Looking around you can see the delight and ecstasy on the faces of the other diners. It’s the kind of place where you want to crane your neck to see what others are eating because you simply don’t want to miss out. Service is absolutely impeccable and the chef is at hand to make any recommendations or answer any questions. 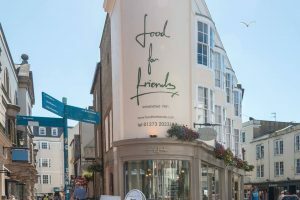 A small, but perfectly formed restaurant which will leave you feeling like you’ve had THE meal of your life. 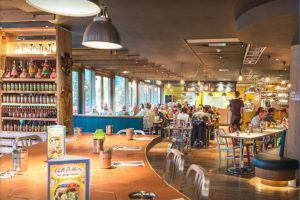 Located in the heart of the Laines, the Chilli Pickle has established itself as the place to go for Brighton curry lovers. Being a bustling family friendly restaurant, we highly recommend booking. Voted as one of the country’s top 30 Asian restaurants it’s easy to see the reason for its popularity. 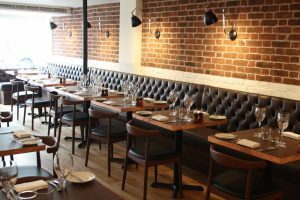 Serving small plates in an industrial-style space with an open kitchen, this restaurant has been was voted Best Restaurant in the Brighton Top 20 Awards in both 2016 and 2017. 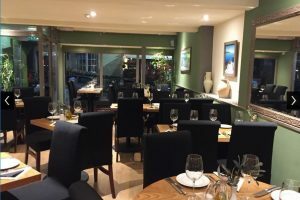 Located in The Lanes and owned by Great British Menu 2017 winner chef Michael Bremner, 64 Degrees offers exciting dishes accessible to everyone. We encourage you to dive into the experience of excellent service and outstanding food on your next trip to Brighton! One of our favourite places to visit as often as possible. 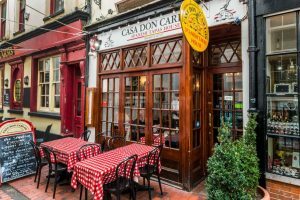 Casa Don Carlos is popular throughout the day and evening so always book to guarantee a table. A small restaurant but big on taste and big on atmosphere. 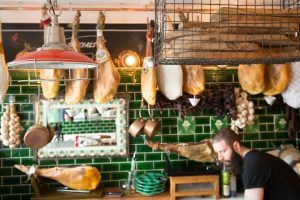 Excellent quality, traditional Spanish tapas served by friendly and happy staff that make you smile. A delightful and fun place to dine. 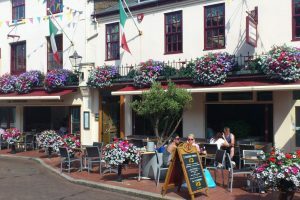 ‘The Restaurant’ was Brighton’s highest scoring restaurant in The Good Food Guide 2011, and it’s easy to see why. Located in the rather swish Drakes seafront hotel, this venue attracts the Brighton glitterati and visiting celebs. ‘The Restuarant’ serves exquisite modern European cuisine with a twist. The evening ambience is calm with dimmed lights and candles all lending themselves perfectly for a romantic dining experience. During the daytime it’s the perfect stop for a special lunch with friends. 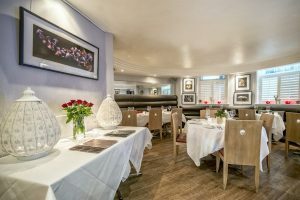 Donatello is a vibrant family run Italian restaurant that has been part of Brighton’s restaurant scene for many years. They serve authentic Italian food made with fresh ingredients and at reasonable prices. The portions are very generous and there is plenty of space for large groups. They can accommodate close to 400 people inside and 50 people al fresco. They also have over 20 vegetarian options available. Family run by two brothers, Adelfia invites you to experience an authentic Greek cuisine in the heart of Brighton. You will be welcomed by friendly owners and staff and served generous portions of great tasting food. There’s also live Greek music and entertainment on selected dates- booking is essential! 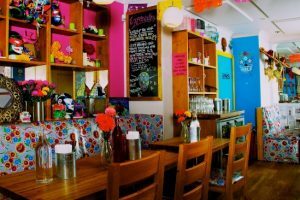 La Choza is Brighton’s first authentic Mexican Street Food restaurant nestled in the heart of the North Laine. A simple menu is served, where you choose between burritos, tacos, quesadillas and tostadas before picking from one of the mouth-watering fillings and sauces to go in it. La Choza is great for a quick lunch on the go or you can sit in and try the delicious selection of frozen cocktails on offer. Most of the menu is priced between £5 – £7.50, so this place is perfect if you are on a budget.